As a direct consequence with working with BRITA this year I am more hydrated, and for the first time really thinking about water as an ingredient. As part of the Better with Brita Campaign, BRITA are offering three people the chance to make and show case their food at UK’s biggest food festivals, The Big Feastival, in the Cotswolds in August (29-31 August). To enter simply create a recipe which uses water and submit it, a photo and the story about your recipe here by the 30th June. As I wrote when I first introduced the competition last month we have noticed a difference when cooking with filtered water – the sourdough is springier and there is noticeably less scum when boiling pasta, grains and vegetables. I am crazy about simple brown rice – and we tend to eat it several times a week. 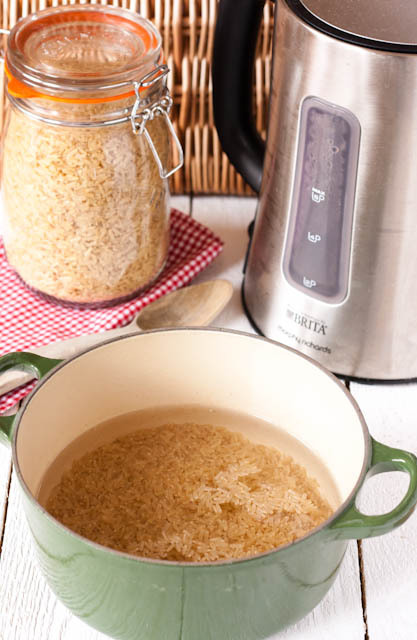 In the past I’ve used a microwave steamer – which takes a super speedy 14 minutes – but recently I’ve moved back to cooking the rice by the absorption method in a heavy pot (I use my Le Crueset) on the stove top. I find it produces perfectly cooked, fluffy, sweet and soft but not mushy brown rice every time. I batch cook, as soon as leftovers are cool they are put in the fridge for the next day (do not leave for longer than 24 hours) or frozen to be used in fried rice. As worktop space is limited in my kitchen my BRITA kettle doubles as a filter jug – I empty it and refill with tap water that I use straight from the kettle without boiling. I served my rice with wobbly, slippery silken tofu which has been simmered in a rich tamari sauce, as well as a generous portion of pak choi. 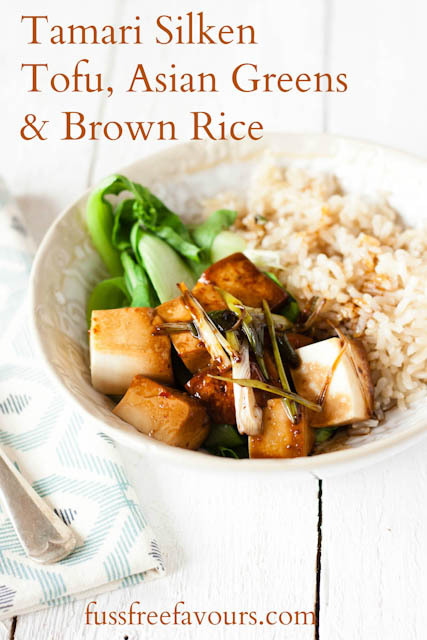 If you try this Recipe: Tamari Silken Tofu, Asian Greens & BRITA Filtered Water Brown Rice please tag #FussFreeFlavours on Instagram or Twitter. It is amazing for me when for me when you make one of my recipes and I really do love to see them. You can also share it on my Facebook page. Please pin this recipe to Pinterest too! Thanks for reading Fuss Free Flavours! 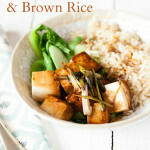 Delicious wobbly Tamari Silken Tofu cooked with tamari and served with pak choi and brown rice. Vegetarian, Vegan and yummy! Place the rice and BRITA filtered water into a heavy casserole dish or saucepan with a well fitting lid. Bring to a simmer over a medium heat and then turn right down and leave for 50 minutes. I put mine on a heat diffuser on the lowest setting of the smallest gas ring. It takes a little experimentation to get it right, but once you have the correct heat the rice will simmer and then gently steam and there will be no bubbling from around the lid. Do not open the pot whilst it is cooking, once you have mastered the right heat. Whisk together the tamari, mirin oil and ginger. Cut the tofu into ½” cubes and place in a dish, pour the tamari mixture over and leave to marinade for 30 minutes. Once the rice has 5 minutes left to cook, carefully place the tofu and marinade into a frying pan and cook over a low heat. Turn the tofu a few times – carefully as it is very fragile, then add the spring onions. Serve the tofu on a bed of brown rice, with steamed green vegetables with the tamari mixture poured over.